I first wrote about the topic here but after a few years, it's time for a refresher as engineers have reinvented the bra since then. (Can I get an AMEN?!). However, 80% of women are still wearing the wrong size. Can you imagine feeling suffocated or having the urge to re-adjust a strap during kickboxing or hot yoga? No thank you. With that being said, make it a point this week, or sometime soon, to get measured at your favorite intimates or sports apparel shop. (Nike, Bloomingdales, and Lord & Taylor are only a few of the many that offer this service for free). With a marathon and a Classpass sponsorship under my belt, I was able to move and sweat in a variety of bras. There were a few standout favorites that aced all my needs with flying colors. Now some of you might be thinking, "but you basically have A cups." Kind of true, they're actually B cups. I've also made the mistake of heading to a race in a flimsy yoga bralette. My breast felt every single stride that took place during those 4 miles so much so that my hands ended up being my "sports bra". Yep. I ran a race while holding my breasts in place. But with that experience came knowledge and a few favorites which I'm always happy to share. 1. Sports bras do come in different styles and support, but the two main ones you'll encounter are compression bras and encapsulation bras. Compression bras are better for low-impact activities like yoga, spin, barre, etc. Bust out the encapsulation bras for high-impact activities like kickboxing, running, basketball, etc. 2. Sports bras are naturally tight but if you're having issues breathing correctly - it's too small for you. 3. Say no to the bounce! Try doing a few jumping jacks in the fitting room as your sports bra should keep any bounce at a minimum. If it's there and uncomfortable, you'll need a bra with extra support in the form of wider straps, racerback or "flexi wire". 4. Spillage means you're not fully supported. Try going up a size and to keep it contained for the best support. 5. Keep it fun when you can! Personally, cute gear always makes sweating a bit more fun. Now go forth and crush those personal bests while with a supportive fit. AND, feel free to leave any of your favorite tips down below! With the marathon coming up and my knees feeling a bit stiff from all the running, I've started to supplement my runs with a few fitness classes (via Classpass of course). It's definitely not normal to run 26.2 miles in one day nor is running on asphalt great for my joints but what can I say - I'm a little crazy. My days of being a spring chicken are far from over (sigh) so my training runs are followed with stiff knees, tight hips, and a weak core. So it's imperative that any additional workouts improve my balance and flexibility. And if I get a six pack in the progress, then hey, even better! Classpass (and New York City) boasts of hundreds of classes but only a few types do the job: barre, pilates, and yoga. Occasionally, I'll sign up for a spin or high-intensity class but those are few and far between since additional cardio might overwork my legs and make them more prone to injury. It's only recently that I learned women runners will suffer from hip issues compared to men. So it's better to avoid them altogether by taking a class that focuses on strengthening our legs, hips, and inner (deeper?) abs. The stronger these main muscles are the less chance I'll end up with a knee injury. It also can't be denied how similar some of the exercises are to those done in physical therapy. For instance, the tucking in barre class is something I've definitely done with my therapist. 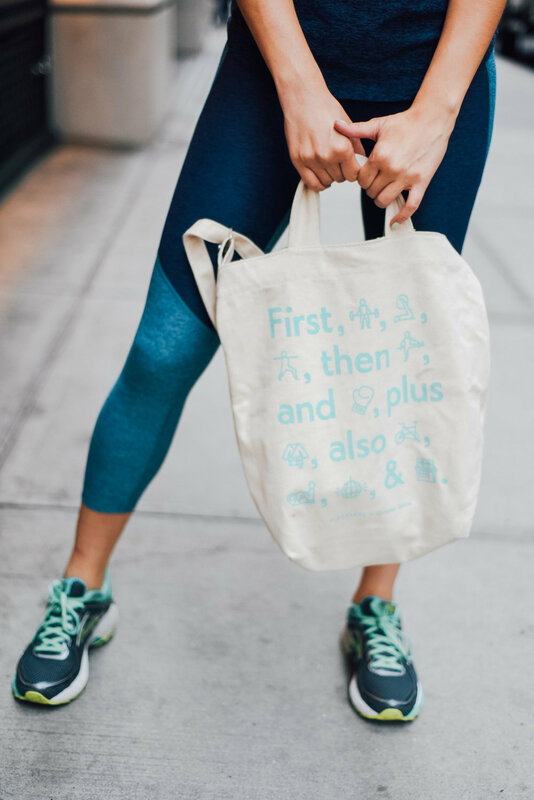 Here are my go-to spots: Pop Physique (cute studios to boot), FlyBarre (accessibility and their Power 45 class is amazing + intense), and Physique 57 (classes are broken up by difficulty level). Similar to barre, pilates increases core strength and helps loosen my hips for a more fluid stride but it's the emphasis on breath control that keeps me coming back. Using my breath with more increased awareness helps on those hilly routes or when I want to increase my pace. Another thing that makes pilates a must for runners is that it helps correct your posture which minimizes a chance of injury. Here are my go-to spots: Flex Studios (always challenging), New York Pilates (wide range of classes and picturesque studio), and Pilates on the Square (I've always felt welcomed here). Runners are notorious for not stretching. I'm definitely guilty of forgoing deep stretches only to regret it later. Enter yoga. The foundation of these classes is rooted in postures that offer flexibility, stretches, and mental focus. Holding a tough pose also trains the mind for enduring long, hard runs. I try to take a class 1-2x a week depending on how tight my body feels. Here are my go-to spots: Sky Ting Yoga (amazing space + amenities), Tangerine Hot Power Yoga (classes are small and teachers are so attentive), Y7 Studio (a bit more energetic and music is fresh to death). I hope this run down inspires you to take a few new classes around the neighborhood. And for those of you not on Classpass, check it out here! It's so easy to add classes to your gym routine and test new studios around the city. Starting my summer with a cast on my wrist was a recipe for cabin fever. Not to mention my training runs were also set to start around the same time. I was going stir crazy, staying tucked away inside. But every moment has an expiration date. And my moment of insanity expired as soon as that cast came off (and I got over my muscle atrophy shock). My surgeon warned me that I wouldn't be as strong as I once was and to take it easy on the long runs. So I tried... For about 14 hours. It felt so good to run off the stress and enter my familiar place of solitude. I gave my legs a well deserved North Brooklyn tour too. Running will always be my first love but with the marathon up ahead it needed to be supplemented with strength training. I did after all take a hiatus on living. 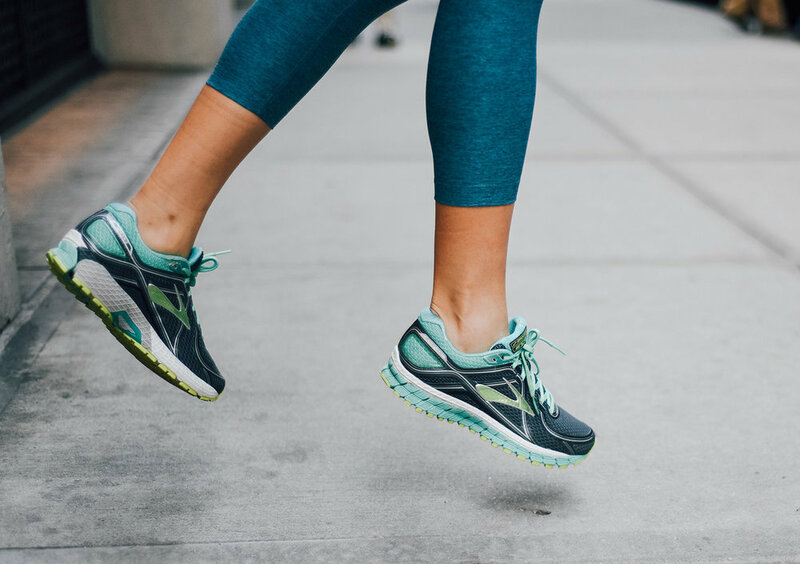 For me, I've supplemented my runs with an assortment of classes on Classpass. Check out their plans here. One of the things I love most about using Classpass is being able to find a workout that works for my time. That usually means AM workouts before heading into my job, an on-the-fly lunch sweat, or later than usual night classes. Lately, it's been crack of dawn AM classes. Not the easiest to get up for but I rounded up a few tips below that make it easier for me and could potentially work for you too! When it's that early, the last thing you want to do is fumble around your room looking for your yoga pants and heels for your workday. Plan it out the night before and pack it up. I usually have it all packed in a gym bag and leave it by the door. If you're venturing out to a new studio make sure you know how to get there and how long the commute will take you. This key for my fellow subway riders. Once you figured that out, plan to leave 15 minutes earlier. It'll give your leeway and the time to scope out the new studio. 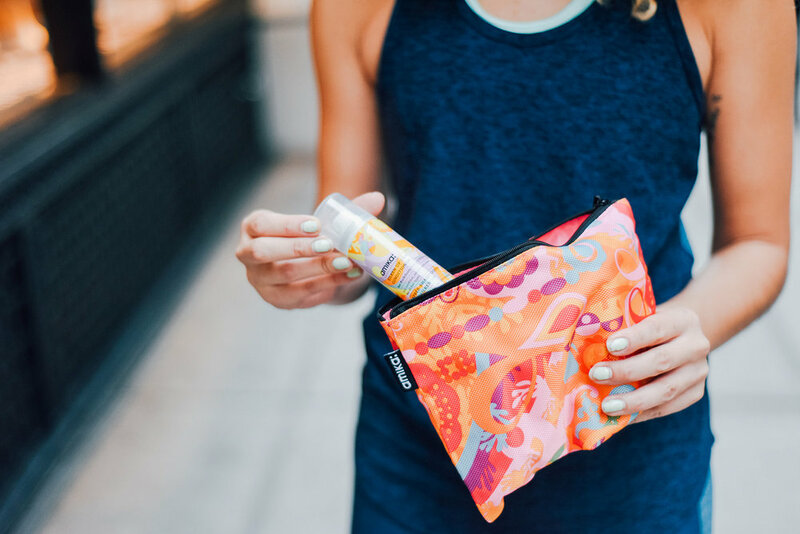 Based on the studio's amenities you could either do with or without the dry shampoo, body wipes, or even deodorant. Classpass will let you know what amenities the studio will have but if you really want to get the full details - check Yelp or their website. I always do and it saves me from carrying too much. In case you're wondering what I do bring, it tends to consist of Amika's travel kit (dry shampoo is a must for curls), my bare make minimums (BB cream, brow pencil, mascara, and a bronzer/blush duo), and deodorant. This. It's so easy to skip this part especially when rushing but try not to since your body does need sustenance before any hearty sweat session. The night before I fill up my water bottle and pack it along with a post-workout granola bar. Are you starting to see a trend yet? For AM fuel I prep overnight oats in a mason jar which are easy to eat on the go. Nothing can ruin an exhilarating sweat session than having to pay for towels, or worse, get stuck waiting in line for the single shower. Again, check on yelp for the studio's shower situation. If it's not looking good book your class at different studio or plan on getting there early so you can be one of the first on their shower signup sheet. After a week of doing strictly morning classes, I felt more energized. And with each class I made sure to avoid that early morning dash by following my tips listed above. Hopefully, I've inspired a few of you to sweat it out in the AM. It's really not that bad once you get into the swing of it. Pinky promise.